NOSE: Supposed to be a standard “pale ale”, but definitely has the hop-forward aroma of an IPA. Lots of grapefruit and pine up front, backed by a not inconsequential caramel malt sweetness. Overall the nose is a bit subdued. TASTE: A nice, accessible pale ale. A good offering for those that claim they don’t like “hoppy” beers, but want to get into them. Grapefruit and citrus hops up front, fading to a biscuity, malty middle, then finishing with a clean, piney hop finish. Very little alcohol presence to speak of. MOUTHFEEL: Somewhere between light and medium bodied with nice carbonation. A touch dry and quite refreshing. DRINKABILITY: Very drinkable. A good session ale. It may not be the most complex or overwhelming pale ale/IPA around, but it does its job and does it well. 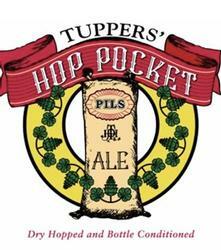 Posted in Tasting Notes.Tagged Hop Pocket, Pale Ale, RFD, Tuppers, Washington DC.